Maruti has announced that it will discontinue the base diesel variant of the Ertiga soon. The homegrown carmaker has decided to halt production of the base LDI variant which is priced at Rs 8.84 lakh (ex-showroom). Therefore, the Ertiga will now be available in a total of 9 variants, including two petrol automatic variants. It is currently powered by a new 1.5-litre petrol engine borrowed from the Ciaz. It makes 105PS of max power and 138Nm of peak torque. It can be had with a 5-speed manual or a 4-speed AT gearbox. The 1.3-litre diesel powertrain has been carried over as is. However, the carmaker is also planning to replace the Fiat-sourced diesel engine with a new in-house-developed 1.5-litre motor soon. This engine makes a higher 95PS and 225Nm of torque and is likely to come mated with a 6-speed manual instead of the 5-speed gearbox used at present. The second generation Ertiga is currently priced between Rs 7.44 lakh and Rs 10.90 lakh (ex-showroom, Delhi). Maruti Ertiga prices start at Rs. 7.45 lakh for petrol and goes upto Rs. 9.96 lakh. The prices of Ertiga diesel variants start at Rs. 8.85 lakh and the top-end diesel is priced at Rs. 10.91 lakh. Maruti Ertiga is available in 10 variants and 5 colours. The claimed ARAI mileage for the Maruti Ertiga petrol is 19 kmpl, and for the Maruti Ertiga diesel is 25 kmpl. Q. Can I pay extra and install parking camera and touch screen infotainment system in VXi variant? Q. Is 3rd row seat comfortable for 6.5 ft person and does Ertiga contain AC in 3rd row seat? Q. Which is the best Maruti Ertiga OR TUV 300? Q. How is the performance and mileage? Q. Which option is better petrol engine or diesel engine? Q. 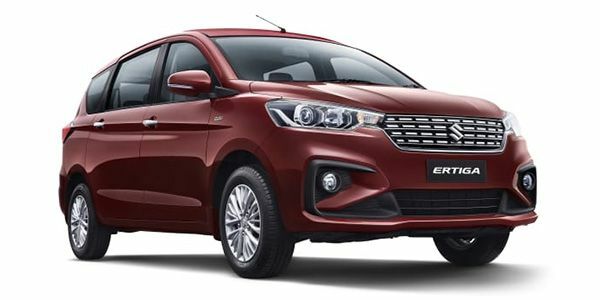 Which is better Ertiga or BRV? The 2019 Ertiga’s design is a lot edgier compared to the car it replaces. That said, it does seem like there was a lot of inspiration from cars such as the Innova Crysta, Mitsubishi Xpander, and even Volvo. But, it does work well together, giving the Ertiga a fresher, more premium look. It also gets snazzy looking halogen projector headlamps, but, weirdly enough, daytime running lamps are not offered. You also get 15-inch alloy wheels, and LED elements in the tail lamp. Overall, the Ertiga looks like it has grown up. The numbers back that feeling up as well. It’s 99mm longer, 40mm wider and 5mm taller. Bigger dimensions mean there’s more space on the inside. First, the boot is 18 litres bigger with all three rows in place, at 153 litres. There’s more room in the third row as well. In terms of features, the Ertiga gets the basics right. There’s a 7.0-inch touchscreen infotainment system with Android Auto and Apple CarPlay, automatic climate control, roof-mounted AC vents with fan speed control. We think the new interior design is appealing, especially because it doesn’t look like it’s a direct lift from the Swift. The light beige on the dash works well with the faux wood trims, making the cabin will airy and roomy. Safety features include dual airbags, ABS with EBD and ISOFIX child seat mounts that are offered as standard across the range. The automatic variant additionally features ESP and Hill Hold. With the Ertiga, you get the choice of two engine options. There’s a 1.5-litre, four-cylinder petrol motor, paired with Suzuki’s mild-hybrid tech, and the good old 1.3-litre diesel. The petrol engine makes 105PS of power, and 138Nm of torque, and can be had with a 5-speed manual or a 4-speed automatic. If you pick the 90PS/200Nm diesel, you get the option of a 5-speed manual gearbox only. In our fuel tests the Ertiga petrol manual managed 13.40kmpl in the city and 16.30kmpl out on the highway. The SHVS mild hybrid system does kick in under acceleration and should make a difference in day to day driving. That said, Maruti Suzuki is developing a new 1.5-litre diesel engine. This motor is expected to make around 95PS and 225Nm of torque, and is likely to be offered with a 6-speed transmission. It remains to be seen when this engine is offered with the Ertiga. The Ertiga is available in four variants - L, V, Z, and Z+. Notably, the petrol-automatic is available in the V and Z variants only. With the base variant, you get standard safety features as well as some goodies such as projector headlamps, cooled cup holders and a colour MID (petrol only). That said, it misses out on basics such as a fog lamp, wheel covers and a music system. Step one variant up, and you get a music system with four speakers, steering-mounted audio controls and some convenience in the form of electric mirrors. The most bang for buck variant in our opinion is the Z, which packs in stuff like automatic climate control, alloy wheels, push-button start and a 6-speaker audio system. Compared to the Z+ variant, it only misses out on a touchscreen, reverse parking camera and a leather-wrapped steering wheel. Honda BR-V: Honda's offering in the segment is essentially a jacked up Mobilio with some mechanical changes to compensate for the raised stance. This SUV styled MPV is the only 'crossover' here that can seat seven people. Renault Lodgy: Renault Lodgy: Renault's only 7-seater in India, the Lodgy is known for being spacious and practical. The sensible choice then? It's faults are a slightly lack luster interior compared to the competition. Mahindra Marazzo: The Mahindra Marazzo is a great overall package especially at the price it has been launched at. It offers ample space for seven, offers a premium looking cabin and comes with an impressive features list with a lot of essentials offered as standard. It’s among the few Mahindras we recommend without hesitating! In its new avatar, the Ertiga isn’t really doing anything substantially different compared to the old version. But, it does everything a little bit better. And that was all that was required, wasn’t it? Why fix it if it ain’t broke? Suzuki Showcases Ertiga Sport: India Launch Possible?